We've had our vintage Christmas records on rotation around here. I found all three at my favorite D.A.V. about a month ago and they are in surprisingly good shape for $1 each. You can't go wrong with Nat King Cole or Frank Sinatra so I knew they'd be good but I mostly bought the Rudolph the Red Nosed Reindeer album for it's cover. It's a happy collection of popular jingles aimed at kids and both of mine love it. This little corner is one of the few corners that feels finished in our new home. My mother-in-law found the old school desk for me, the metal crate was a flea market find, the mirror was thrifted in town before we even moved here on a Red Velvet weekend, the paint-by-number and frame were also found locally. The Crosley record player is the one from Urban Outfitters that Brett surprised me with for my birthday. We've since curated a nice little collection of mostly new records. I have a feeling that we'll be adding a few more after Christmas. Ruby's most used sign from the baby sign language that we've taught her so far is 'music'. It's just waving your hand back and forth like you're conducting an orchestra but she's always busting it out whenever Brett is around. Brett usually has music on when he's home and she's got a strong association between the two. This morning the first thing she wanted when she woke up was her daddy and his music. Considering she was sick and hadn't really eaten much all night it was surprising that this would be her first request! She also likes to put her coat on when she sees Brett heading out. She's her daddy's biggest fan and he loves every minute of it. She does not like being sick. I took her to the ER last night after she'd thrown up a few times and wouldn't nurse because of congestion. She had a fever of 102 and a slight case of pneumonia so she's now on antibiotics and we've been playing with our new electronic aspirator. (Thanks for the heads up, Sarah!) The funniest thing about it is that it plays music to supposedly distract the baby from the hum of the little motor. I find it's hard to get interested in a song when it feels like your brains are being sucked out your nose but it's helped clear her up faster than the traditional blue bulb so we're sold on it. Brett picked ours up at Walgreens but Wal-Mart, Babies R'Us, and a few other online stores carry them. Hoping for a healthy weekend for all. AWWW so sorry your baby girl is sick. Why does it always seem to hit around the holidays. Let me tell you, we have that electronic aspirator and I find it works good. But the best thing is a few squirts of normal saline...clears them out great. Also, you can get a jar of baby vicks and just open the jar and leave it on her dresser or where ever in her room. Vapors go into the air and works great too. Hope Ruby feels better soon. 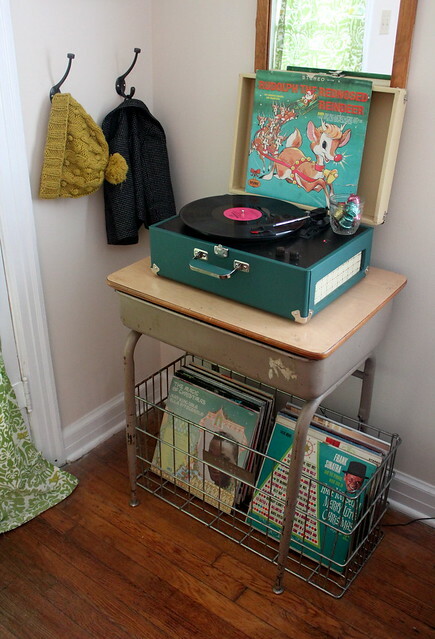 BTW, love the vintage record player and the way the entire corner is set up! Awww... my little Ella Hope had a touch of pneumonia last winter and we ended up at the ER for the same reasons. No fun!!! The nursing thing was hard when she was that sick. I hope your munchkin will feel better by the weekend. They bounce back so fast! Poor little Ruby! When I get sick, I just sleep and drink lots of warm tea. With Violet, she tends to cuddle if she is super sick. 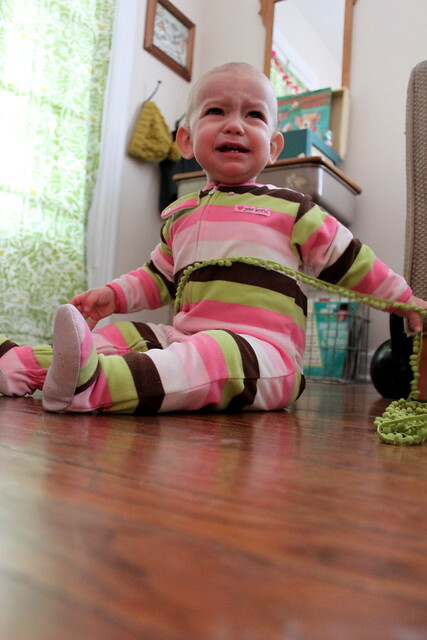 She used to get ear infections a lot, so those 102 fevers are quite scary and sad! Thankfully she is over the ear infections, moving onto bigger and better illnesses, such as pink eye! 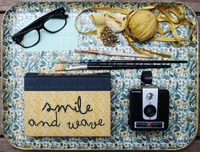 So in love with your record player and desk! Best wishes for the Holiday! aww, i'm so sorry that your little girl is sick! there's something super nasty going around, for sure. that corner is so awesome! i love the record player. Aw so horrible - poor little bubby....My little girl got pneumonia really bad when she was 20months. Up in hospital for a week or so - so hard to watch them when they're sick huh? My mom used to always chop up an onion and put it next to my bed when I had a blocked nose so that it would all drip out. She'd also chop up Spanish onions (?) and let the juice drip out over a bowl and put a little sugar in with it for cough syrup. If we had a phlegm-y cough she'd also cook a potato, mash it up a bit and put it in a cloth and lay it on our chests so that the phlegm would become runny and easier to cough up. As you can see she likes to shun the traditional medical route...and still does now, but it always helps! Good luck with Ruby! I'm in love with your record player! i really hope ruby will feel better really soon. hugs to you all! ps. i really love your record corner. poor little thing! I hope she gets better soon. 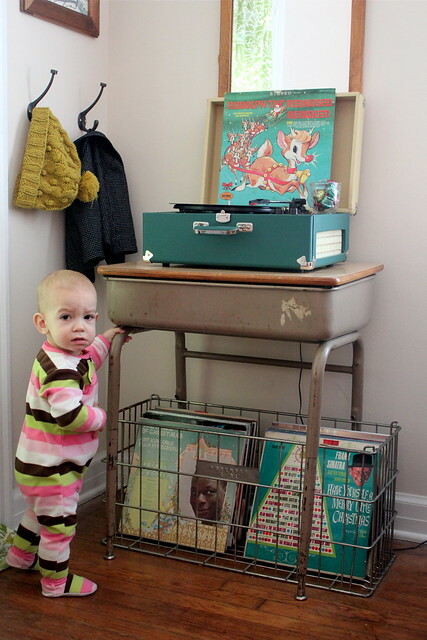 Also..I love your record player. Ahhhh Ruby. We are sick here too. I guess it is that time of year. I give my girls lots of freshly squeezed orange juice and my hubby is making us some veggie soup with soba noodles and lots of rest. Hoping for a healthier weekend for all. Ohhh we love our electronic snot sucker... It is THE best!!! Fingers crossed she feels better soon!! We went to Chuck E Cheese last night and I walked in with a huge bottle of hand sanitizer. I am now "THAT MOM." LOL!! awe, sorry she is sick. that's no fun! 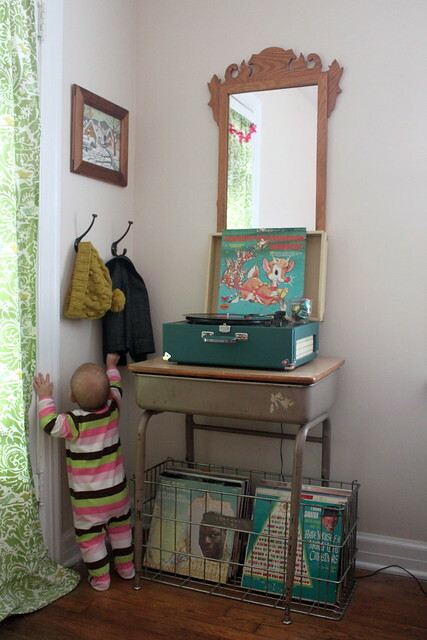 i love your little set up with the record player area! so awesome! Ah! I love vintage records. Specially christmas ones. The songs and scratchiness of the player seem to be made for one another. Hope the little one feels better for the holidays! Sorry she is sick! Hope she gets to feeling better soon. 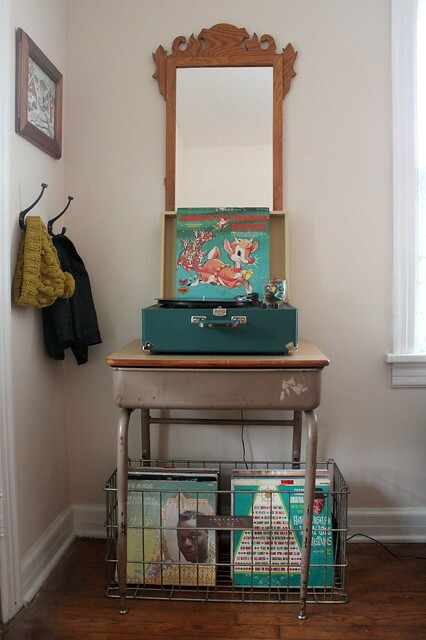 I am swooning over your vintage record set up...how amazing!!!! hope the pneumonia goes away quickly! poor thing! they're little champions. hope everything's a little bit better! wow, your decor is amazing! I love it! Oh, and meant to say, so sorry about Little Ruby! My 17 month old is also under the weather and we are heading to the Dr. this afternoon, I'm guessing ear infection. Poor Girl!! 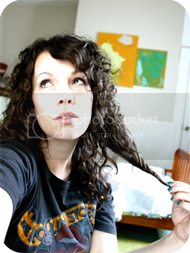 SHe is a cutey, though. I wish I was as creative as you! 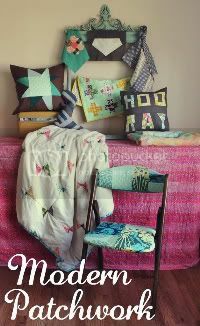 that little vintage section of your home gives me so many ideas! kudos! I put the humidifier on (even though everyone always says to use cool mist humidifiers...I guess Im oldschool) and I get a stack of books, coloring books, movies and toys for my kiddos to play with. Along with tissues and vicks vapor rub. They also get a bell to ring and a big glass of cold water. If its stomach we stick to the "Brat" diet. Bananas, rice, applesauce, toast. Its sooo awful when the littles are sick it makes my heart break. I hope your sweet babies feel better soon and you and your hubby stay healthy! Hope she's feeling better soon -- and that nose contraption looks brilliant! It's torture sucking boogers out of my poor daughter's head with one of those bulbs! At the school I work in, we had two students with a slight case of pneumonia and two teachers as well!!.. And I live in Puerto Rico! It must be spreading far and wide :/ Hope your little red feels better soon! Yep, family of three all sick around here. No fun. Ruby is TOO cute! When I was a baby I had absolutely no hair either..
Love what you're doing with your new home, I am very much enjoying your little peaks. I have been looking for a decent record player for a long time now and haven't been able to find one. Yours is absolutely perfect! My mom used to put Sprite in ice cube trays and give me "Sprite Ice" as I used to call it. I would crush it up, it's oh so good. You've mentioned teaching your babies to sign a couple of times and I wonder if you could do a post about this...I don't have kids yet, but I've been around a lot of them all my life and haven't heard of teaching babies to sign before. It sounds so helpful. I always have to have grilled cheese and tomato soup when I'm sick. I make it for my son. My Mom used to make it for me when I was little, and her grandmother used to make it for her when she was little. It's kind of a tradition I guess you could say :) Hope she is feeling better soon! Having a sick baby is the worst.